This piece was created using Sakura oil pastels and colored pencils. It displays the various differences that people have, and brings them all together, showing what America today is comprised of. 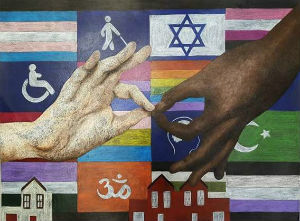 This is amazing, I especially love how detailed the hands are and the diversity of the flags in the background. The materials you used also add a unique touch. This is incredible! How long did it take you to make this? What/who was your inspiration?
" An eye for an eye only makes the world blind"
This is great, keep doing art. I LOVVEEEE THISSS SO MUCHHHH!!!!!!! !